The web servers that I am using to show how the LBaaS works have been preconfigured with a unique hostname and a php page that returns the hostname of the server that is responding to the request. The web servers do not need a floating IP assigned to them. 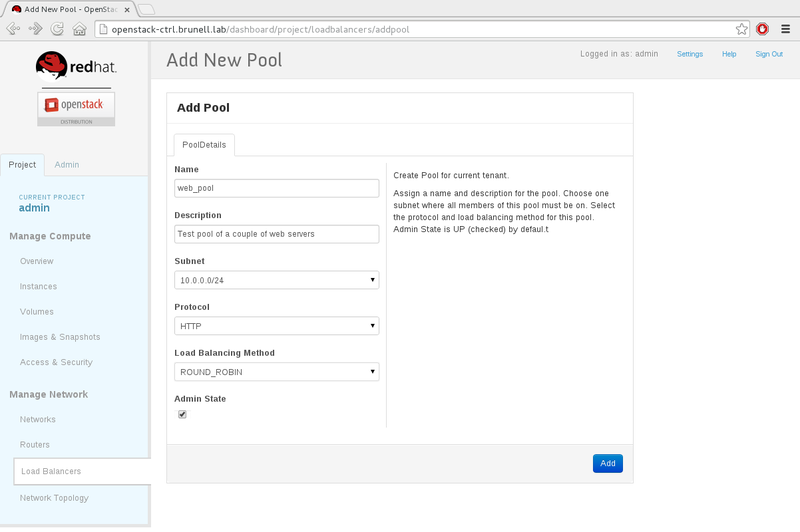 First, we update the Horizon web interface to allow the LBaaS configuration to be included in the UI by editing the /etc/openstack-dashboard/local_settings file and adding the following lines. I typically add these right after the closing curly bracket from the OPENSTACK_HYPERVISOR_FEATURES stanza. Next, add the plugin configuration to the /etc/quantum/quantum.conf file by adding in the following line in the “[DEFAULT]” section of the file. I normally add the line in after the core_plugin line. After that, restart the web server. 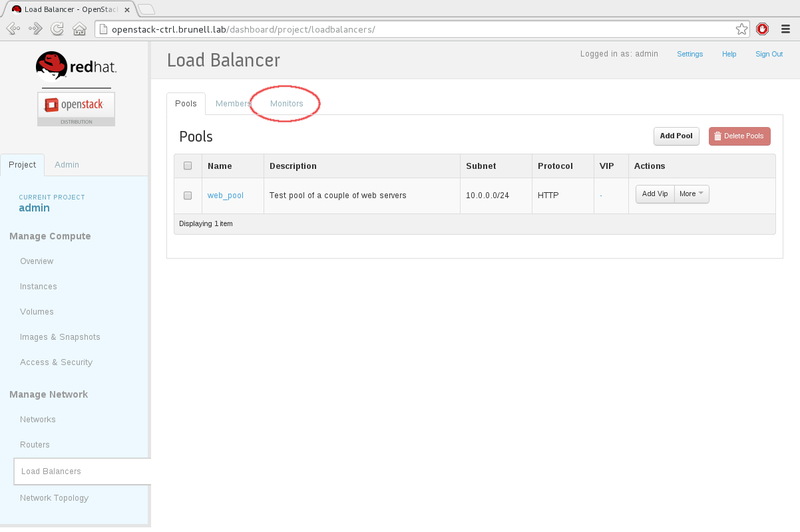 If you open the Horizon website and log into your project, you should see a menu option for “Load Balancers” now. 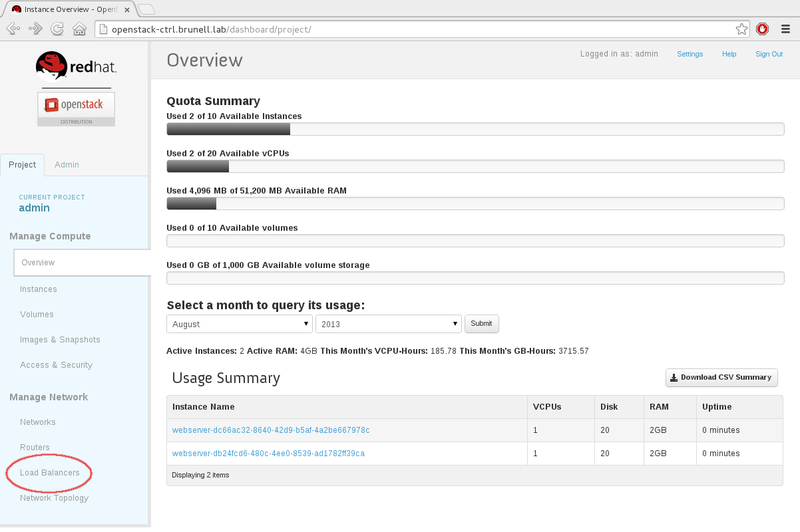 The next steps take place on the nodes that will provide the actual load balancer service. For my setup this is the Nova-Compute node, server3. The first step is to move the lbaas-agent.ini file to a new location and symlink it to /etc/quantum. For the next step, ensure the following lines are included in the /etc/quantum/lbaas-agent.ini file and are not commented out. You need to also ensure that the haproxy package is installed. The service does not need to be configured or started. Now, restart the quantum-agent services to and turn it on to complete the configuration. Don’t be alarmed by the “failed” status below. That is just a result of the service having never been run before. 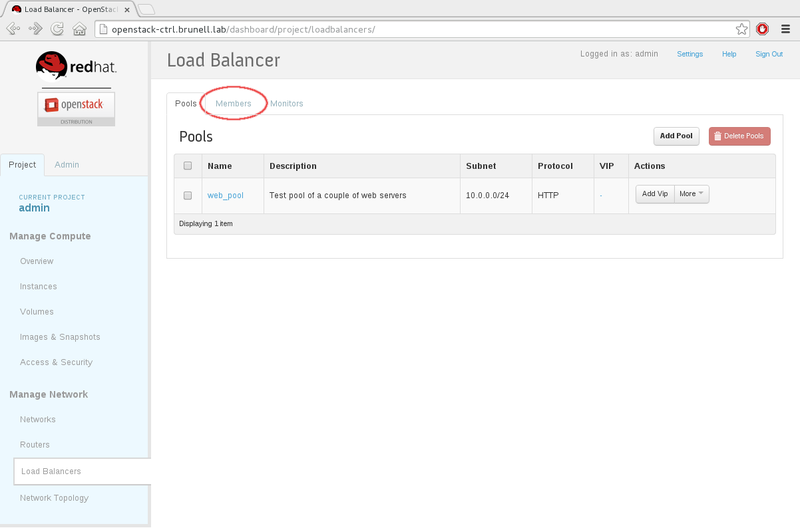 Once all of the services are up and running again, click on the “Load Balancers” link that was highlighted previously. You may get any errors such as the ones shown below, you may have to check your settings or reboot your OpenStack installation. Description: Test pool of a couple of web servers. 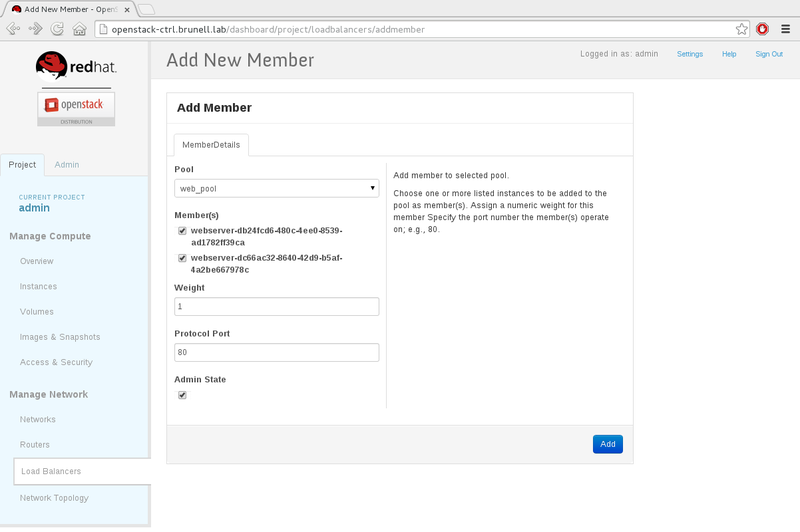 After adding the pool, we need to add members (instances) to it. To do this step, click on the “Members” tab near the top of the screen. Now, a monitor has to be added. 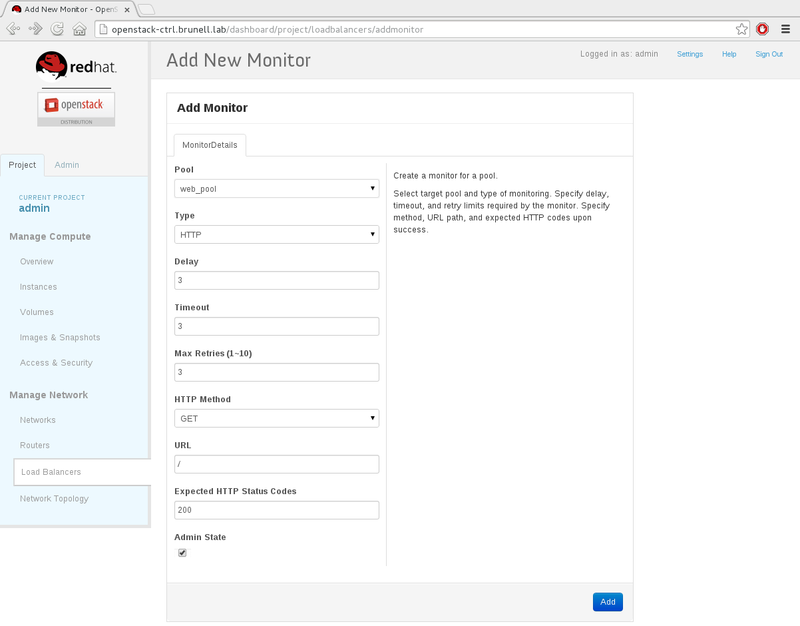 A monitor is used to determine which load balancer members are capable of serving requests. To do this, click on the “Monitors” tab near the top of the page and then click on the “Add Monitor” button. The final step is to assign a floating IP to the load balancer that was just configured. 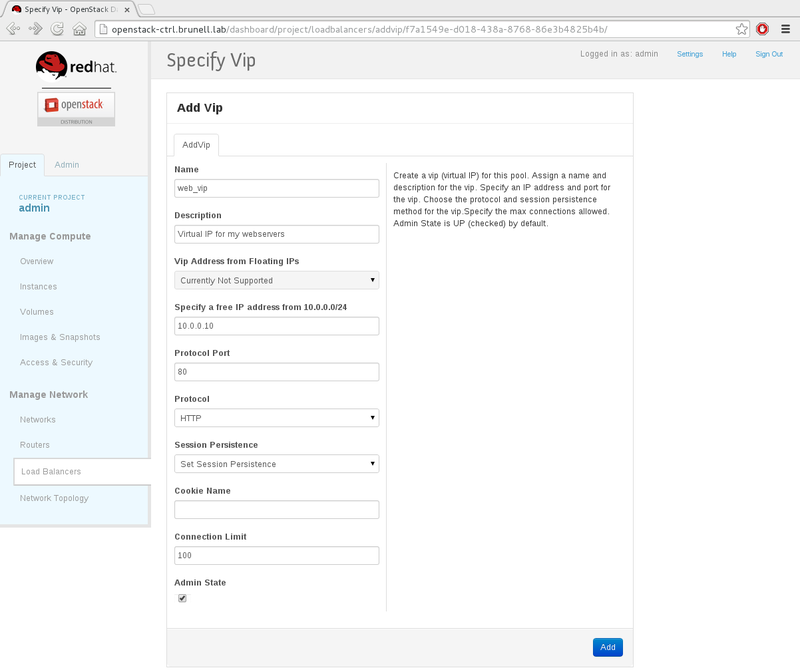 To assign a floating IP, click on the link along the left side of the page for “Access & Security” and then click on the tab for “Floating IPs”. If no IP addresses have been assigned to the project yet, you can click on the “Allocate IP to Project” button. 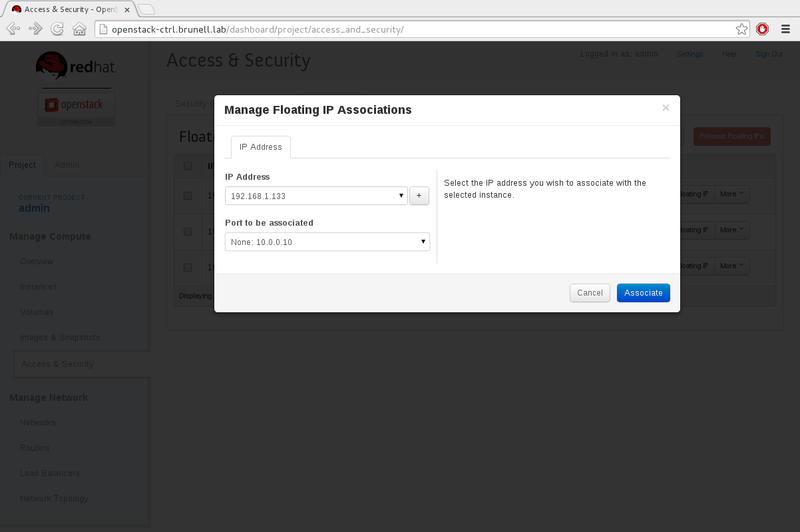 I already have three IPs assigned to my project, so I will use one of those by clicking the “Associate Floating IP” button and assign it to the load balancer. As you can see in the below screenshot, the load balancer show up as “None: 10.0.0.10” in the Port to be associated field. Once this step is complete, your web servers should be ready to test. There are two easy ways to test the LBaaS. You can use a web browser and navigate to http://192.168.133 (or whatever floating IP was assigned) or use the curl command. What you should see in either method is that the hostname that is returned by the php page bounces back and forth between the two hosts that are members of the load balancer pool. If you get a “connection refused error” check and see if SELinux is getting in the way. You can do that by executing the following command on the server that is running the LBaaS service (server3 in my lab). If SELinux is blocking connections you have two options; you can use audit2allow to try to figure out what is causing SELInux to block connections. In my case, it was because a boolean was not set properly. In a lot of cases, audit2allow will tell you exactly what you need to do to fix issues with SELinux. The boolean allow_ypbind was set incorrectly. And that’s it. 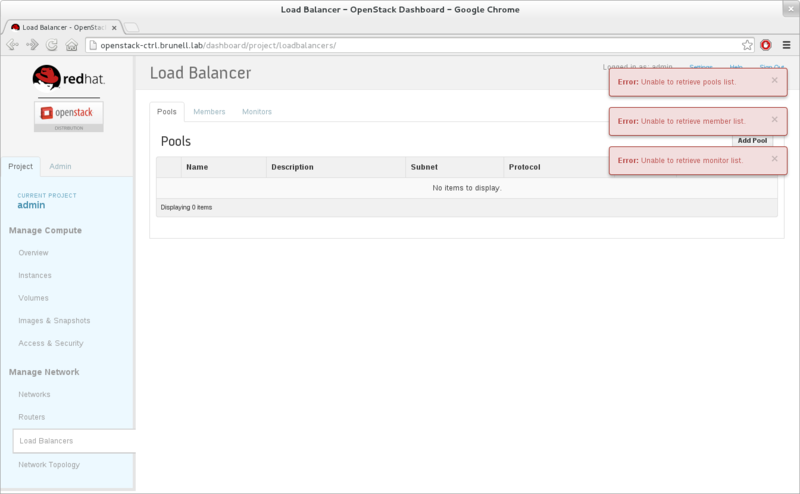 I hope you enjoyed this and will find many ways to use this OpenStack feature. LBaas… new one in the block..
Heya i’m for that key period here. I came across the following table we in discovering This process useful & the idea forced me to be available considerably. I hope offer a very important factor yet again and also help other individuals just like you served me personally.